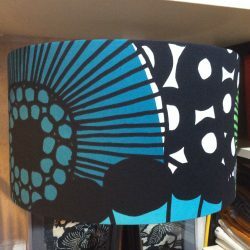 At Chee Soon & Fitzgerald we have a variety of lamp bases available and also offer custom made lampshades. Lamp bases include our own CSF designed kauri pine base, this has a shade designed to fit with the proportion of the base. This design comes in two sizes, a larger style which can be placed on a low table or on a sideboard. The smaller style is a great bedside table lamp, or could also sit in a higher position anywhere in the house. We also make table lamps from old Japanese Sake bottles. These come in a variety of colours, including frosted white, green, and an amber/brown. The Sake bottle lamp has a tapered shade, which we can cover in a variety of fabrics including fabrics from our vintage Japanese kimono collection. 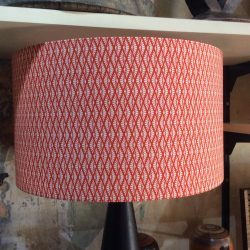 Lampshades can be made to order in other sizes and fabrics apart from what is to offer on our showroom floor. These generally take up to two weeks to make. Proportions depend on fabric widths especially with the vintage Japanese fabrics, as they are narrower than normal. 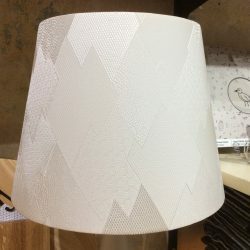 Different sized lampshades may take longer to be made if the wire is not available or the fabric is not in stock.